I awoke from a restless sleep with the thought that I had something I had to do, someone I had to meet. It was 4 a.m. but I was up and ready. My thought was to make the commute into Downtown Tampa, park the van, walk to City Hall then walk back to the van before the streets became too hot. 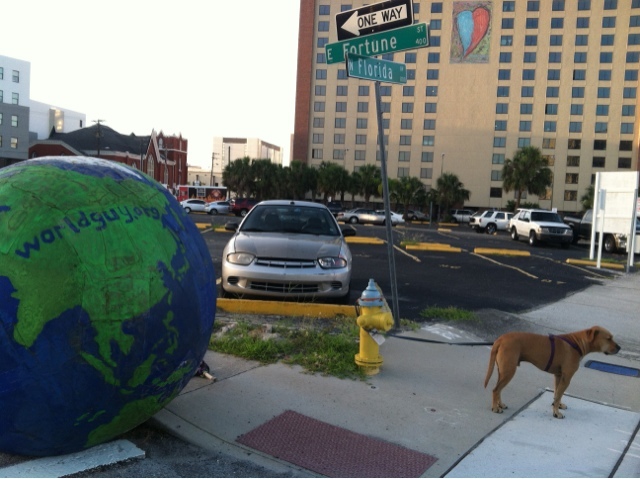 I quickly made coffee, gathered my things, got Nice (the dog) in the van and we were off to the heart of Tampa. When I got just past where we had stopped at the church the previous day I could see I had made the right decision. There was a drawbridge that would have been very dangerous. Then turning toward downtown all the sidewalks were narrow. Many were under construction. It was not long before I was lost in a tangle of one way streets that sent me into the narrow backstreets. I was glad to see the old neighborhoods that I could not have easily rolled the world thru. I found my way back to the expressway after routing "city hall,Tampa" on the GPS. When I exited the ramp into downtown I was behind a patrol car and decided to follow him. It was shift change and he happened to lead me to an affordable parking lot by the bus station. If I hadn't lost my way I would not have ended up behind the patrolmen who unknowingly guided me to the perfect spot. 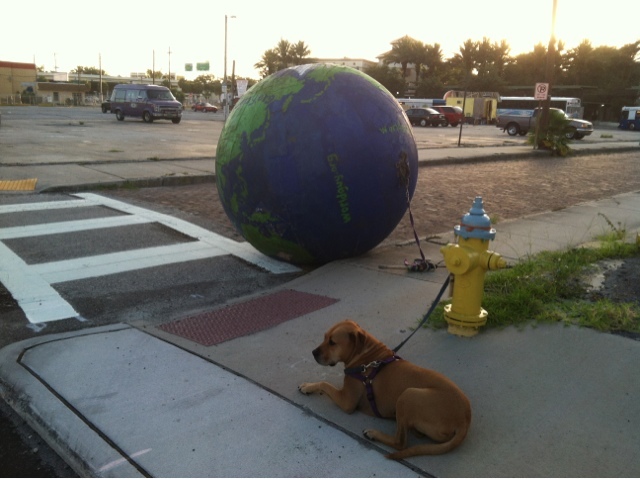 I inflated the world and was ready to get started as the sun broke over the skyline. I walked over to the brick-paved street nearest to us. We arrived at the corner of Fortune, just as a woman in an electric wheelchair rolled to the same corner. She asked what I was doing. I gave her a quick explanation. She said that she was diabetic. I shared some examples of people I know who have hardly been able to walk to their mailbox, who now can walk miles. I think I made an impression on her. One that might motivate her to do a little everyday. Become free from her chair. At least she was happy and smiling when I walked and she rolled away. Coincidences such as these make my life rich. My pot of gold at the end of the rainbow. At the end of this little journey. 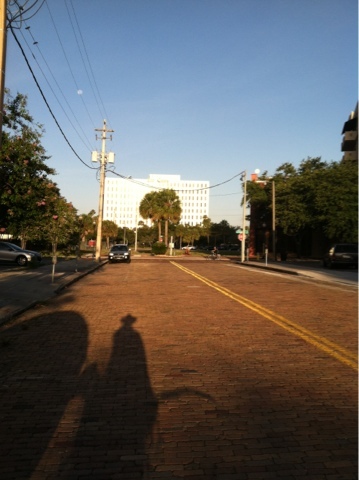 On the corner of Florida and Fortune with bricks glowing gold from the sun. She was the person I awoke telling myself I had to see. "I awoke from a dream. Good post Sir Bendl !!! !